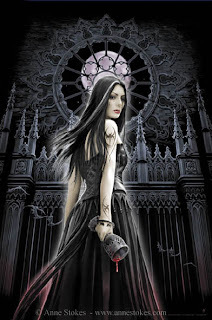 Anne Stokes is a fantasy and gothic artist who works as a freelance illustrator for about 12 years. She realized artworks for the games industry including illustrations for Wizards of the Coast’s Dungeons and Dragons rule books and miniatures. 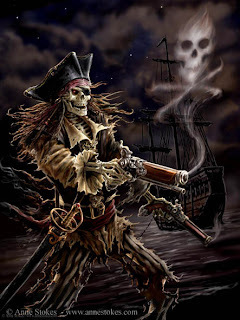 Anne Stokes’ artwork was featured on many merchandise such as T-shirts, posters, book covers, calendars, sculptures, jewellery and tarot and greetings cards. She currently lives in Leeds in the United Kingdom with her husband, Ralph Horsley (also a freelance fantasy artist), and her son, Leo. Dark Wolf: Anne, thank you very much for your time and for the interview. How did you become interested in art? What is your first recollection when it comes to art? 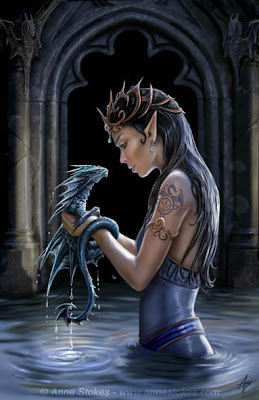 Anne Stokes: I always loved to draw and make things when I was a child. My parents were always very supportive of this. I discovered fantasy books when my father read me the Hobbit and then of course I loved fantasy art also. Dark Wolf: Who are your favorite artists? Which are the influences and inspirations of your art? 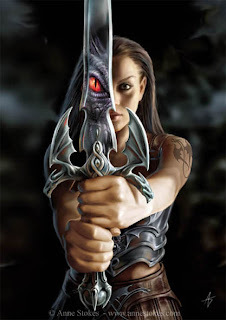 Anne Stokes: Todd Lockwood is my favorite artist. His style is just awesome. I like to look at photographs of wildlife and scenery to give inspiration for my paintings. Dark Wolf: You start your images in pencil on paper and then you move digitally. Do you prefer the traditional methods of work (oil, acrylics, pencil) or the digital methods? Anne Stokes: I find it easier to draw with a pencil on paper but painting digitally gives extra scope for changes and alterations that are often necessary in commercial art. DW: Your husband is a fantasy artist as well. How much influence do you have on each other’s works? Do you consult with your husband when it comes to certain pieces? AS: It is great to be able to ask Ralph’s opinion on a picture I am painting. His work is very detailed and this has definitely made me want to put more into my pictures also. DW: Some of your major subjects of your works are related to gothic and horror themes. From where comes your interest in gothic art? 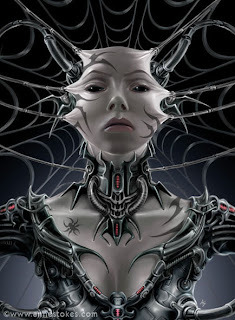 Are you interested in other forms of gothic art too? AS: The gothic style is great and interesting to work with. It is very popular at present and so I am often commissioned by companies to paint such subjects. DW: Also one of your major themes is fantasy. Do you prefer to work on fantasy or on horror pieces more? Do you like to explore the fantasy genre in other areas as well? DW: Your portfolio has many art works of dragons. Also it seems that some of your works have a symbol of a dragon as signature. Do you have an interest in mythical creatures in general or just dragons in particular? Do you consider the dragon your talisman? AS: I have always loved dragons. They are the most iconic fantasy creature and as such are a great subject to paint. I have got a little bit of a reputation for painting dragons so I have been commissioned to paint them quite often. DW: Recently some of your works have been made into sculptures. How are you feeling about this new approach for your art? Did you create some pieces especially for this process and if yes, how much different is the creation of this piece than the usual ones? AS: It is great that sculpture manufacturers Nemesis Now have chosen to do a range of sculptures of my art. The first set was all made from artworks that I have painted previously, but I have been working on some new designs especially for the purpose. How the art will translate into a 3d object is something to consider and has been an interesting challenge. DW: Also some of your artworks were turned into tattoos. How do you feel knowing that your art is on permanent display? Did you ever make a piece especially for someone’s tattoo? AS: It is very flattering when someone likes one of my painting enough to want to get it tattooed on. I have a very busy schedule so I rarely get time to work on a commission specifically for a tattoo. DW: I know that this is an awkward question and it is difficult to chose, but do you have a favorite work from those you have made so far? AS: I am very critical of my own art. I always try to improve and try new ideas. It is easy to see only the faults in your own art and try to move on to a new and hopefully better image. So always the next picture will hopefully be my best. DW: Do you think that your technique needs to be improved further on and what do you like to improve at your art? Is it something that you would like to change on your career? AS: Like I said for the previous question, there is always room for improvement. An artist that cannot be self critical is in trouble. I have moved my career more into just working on my own ideas that I paint and license on to different companies and products, rather than doing commissioned work. I found this very rewarding creatively and business wise it is going well for me also. DW: What are your immediate and future plans? AS: To get my artwork more well known and to have an art book of my work published. Thank you very much for your amiability and answers. It has been a pleasure. 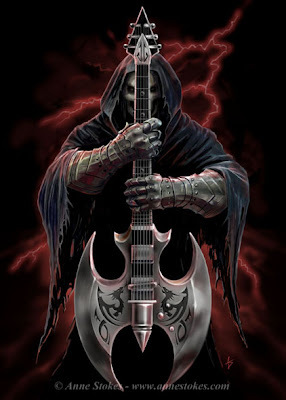 For complete imformation about Anne Stokes and a comprehensive portfolio please visit her website, annestokes.com. Excellent paintings. The first with the dragon hatchling is my favourite. I saw some of her artwork before. I like especially the gothic realted ones. Love her dragon's! My favorite so far is Soul Mates. although there are a few other's that come close. I also love Angel Rose. Fantastic artist! Her work is phenomenal. My favorites are Soul Mates & Angel Rose. Love all her work with dragons.